Actor Vaibhav Reddy who is riding on the success of his recent release Kappal has signed his next Tamil movie. 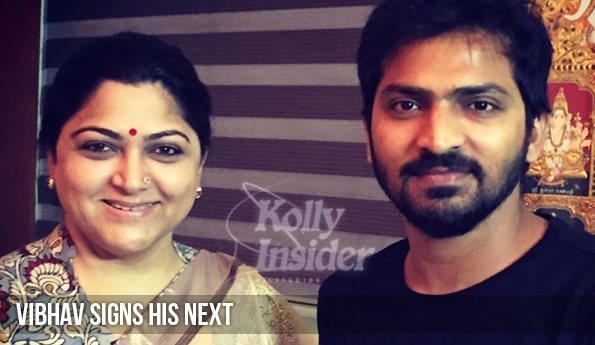 Kushboo is producing this untitled Vaibhav starrer under her home banner. This will be Vaibav's second movie under Kushboo's 'Avini Cinemax' after Vishal's Aambala. Excited Vaibhav took the news to his micro-blogging page and thanks director Sundar for this opportunity. "Signed my next project with AVNI Cinemax .. Thank u sundar sir :))) and producer kushboo mam @khushsundar", posted Vaibhav in his official Twitter page. Kushboo confirmed the news in her twitter page and revealed that this movie will be directed by a debutant. She hinted it will a comedy entertainer.